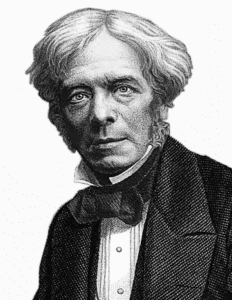 As early as 1829-1830 Francesco Zantedeschi, Michael Faraday and others were ferreting-out the concept of induction, which would eventually lead to useful communication through the air. This was mostly theoretical work with contraptions capable of transferring energy a few inches. Andrew Jackson is our 7th President and the typewriter is patented around this time. 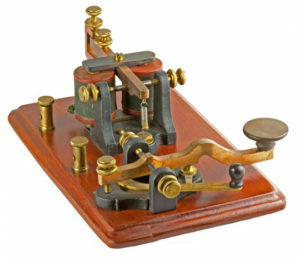 In 1850 a few, (very few) people were communicating via wired telegraph using dots and dashes arranged in something called Morse code. It was expensive, slow, and unreliable. There were only about 23,000,000 people living in America at the time. The discovery of Yosemite Valley led to the beginning of the Mariposa Indian War. The West was indeed still wild. Ten-years later, in 1860s, railroad and telegraph lines stretchedfrom the East Coast to about St. Joseph, Missouri. From there the only way west was by horse or stagecoach. In 1861, (only a year later), both coasts are linked by the telegraph. The telegraph is used extensively in the U.S. Civil War, (1861-1865). Around 1870 dry cell batteries are invented making it easier and safer to move stored electricity. Chicago is virtually destroyed in the “Great Chicago Fire” that year. Perhaps the first person to notice that he could transmit and receive sound wirelessly was David E. Hughes in 1878. He heard noises in his telephone receiver that were accidentally created by another nearby electrical device he was using. The phonograph was patented by Thomas Edison in 1878, and a postage stamp cost $0.02. Thomas Edison invents the vacuum tube in 1883 but doesn’t realize it. He demonstrates that electrons can move from a glowing filament to a metal plate in a vacuum. The significance and potential of this discovery are not yet fully understood in 1883. 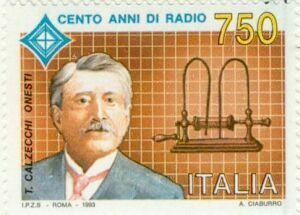 In 1884 Temistocle Calzecchi-Onesti, an Italian, invented a tube filled with metal filings, called a coherer. 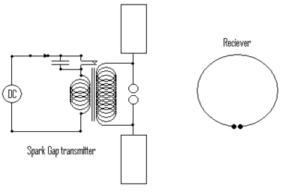 The filings react to radio frequencies therefore acting as a “detector” used in wireless telegraphy. Some historians give credit for the device to David Edward Hughes, Eduardo Branly and others who more likely perfected the coherer or adapted it to wireless applications rather than inventing it. This would become a key component in early wireless receivers. Mark Twain began to write Huckleberry Finn. The first long distance telephone call is made—from Boston to New York. The phrase “Can you hear me NOW?” is coined. Thomas Edison patents a proposed system of wireless ship-to-ship communication in 1885, but never implements it and later sells the rights to Marchese Guglielmo Marconi. The first skyscraper is built in Chicago, Illinois. It is a whopping ten-story wonderment. The roller coaster is patented. Around 1886, in Germany, Heinrich Rudolf Hertz refines and publishes his wave theory, which will be the foundation for much of the mathematical underpinnings of radio technology as we know it today. The first gasoline powered is patented by Karl Benz. Geronimo surrenders in Arizona. Coca-Cola is invented. 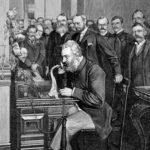 As far back as 1887 Alexander Graham Bell demonstrated his concept of a “music room” where people could be entertained over a “loud-speaking” telephone apparatus. It was not wireless, however. The Hollerith punch card calculator is patented, a precursor to the computer. In 1888 Heinrich Hertz detects and produces radio waves, although the term radio is not in our lexicon just yet. 1888 also ushers in the beginnings of the women’s rights movement, deodorant, movie sound technology, and the yields the trademark Kodak. Photography is becoming a hobby now. 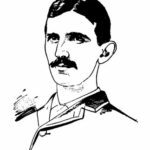 Nikola Tesla gives an impressive demonstration of all the key ingredients for wireless communication during an 1893 lecture at the Franklin Institute in Philadelphia, Pennsylvania, getting scientists, experimenters and the press interested in this budding technology. The U.S. Marines overthrow the Queen of Hawaii and her government. Edison constructs his first motion picture studio in New Jersey. Okay. Now the controversy begins. The first practical demonstration of wireless technology is generally thought to be either Marconi’s 1894 wireless ringing of a bell 30 feet away, or Tesla’s lab work circa 1895 or perhaps Marconi’s transmission and reception of Hertzian Waves over a distance of about two-miles in 1896. Or, perhaps it was Russian Alexander Popov’s May 7, 1895 demonstration at the Russian Physical and Chemical Society in St. Petersburg. According to eyewitness recollections, about ten-months later, on March 24, 1896 Popov demonstrates wireless telegraphy between two buildings 800 feet apart. There are no formal written records of this achievement. In any event, at about this time Marconi thinks that these waves might be used for communication, specifically in the maritime industry. In 1897 The British Ministry gives Marconi funding to experiment. His signals eventually reach 100 km. 1898 demarks the beginnings of wireless hobbyist activity as illustrated in an article written by Leslie Miller for a British magazine called The Model Engineer and Amateur Electrician. It’s titled The New Wireless Telegraphy. Experimenters get to work. By 1899 Marconi has sent wireless signals 32-miles, bridging the English Channel. The first auto repair shop opens in Boston, Massachusetts. Aspirin is invented. What would the 1900s bring? Have you been to any of the museums and websites devoted to these early days? What do you recommend seeing? Do you have tips and experiences to share? Questions? Suggested corrections or additions? Leave a comment below. I’ll review comments and post or incorporate the most useful ones. Your email address is required if you choose to comment, but it will not be shared.